Loren V. Silva passed away unexpectedly, Saturday, April 13th, at twenty-eight years of age. She was the beloved mother of three-month-old, Sydney. Cherished daughter of Robert Silva Jr. of Woburn and Susan Silva of Tewksbury, she was born in Malden and raised in Woburn. Loren attended St. Charles Elementary School was a graduate of Matignon High School in Cambridge, where she was a cheerleader for the Football and Basketball teams. 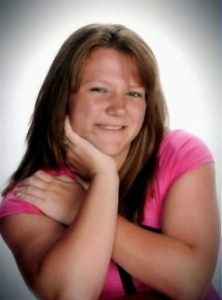 Loren was very active in sports in her younger years, participating in softball, basketball and pop warner cheerleading. In the last few years, Loren received her EMT Certificate and was working as a Paramedic for Lifeline in Woburn and Cataldo. Helping others in their time of need was most fulfilling for Loren, and a work environment where she had made many lasting friendships. Loren was a vibrant and happy young lady, with a presence that could light up the room. Her sense of humor, hearing or cracking a good joke and being goofy, were all part of Loren’s wonderful makeup. Being surrounded by her family and friends was always what she enjoyed most. She has left a gaping hole in her family’s heart and will be deeply missed. Along with her daughter Sydney, and parents Robert and Susan, Loren will be deeply missed by her siblings, Robert J. Silva III and Allyson Silva, both of Woburn. Devoted niece, cousin and friend of many. A Funeral will be held in the Lynch-Cantillon Funeral Home, Friday morning, April 19th at 10 a.m. Relatives and friends are respectfully invited to Calling hours on Thursday evening 4-8 p.m. Interment in Woodlawn Cemetery, Everett. Allyson, I am so sorry for your loss. Know that you are in my thoughts. If there is anything you need, do not hesitate to ask. Thoughts and prayers from Darin and Carla. Silva family so sorry for your Loss. I’m so sorry to here of Loren’s passing. Loved coaching her in Sox softball. She was an amazing young women and so much fun to be around. God bless. So very sorry to hear of this great loss. Please know that our thoughts and prayers are with you all. My prayers go out to you all, I’m so sorry for your lost my prayers are with you all at this time of sorrow. May care and love of those around you provide comfort and peace to get you through the days ahead. My most sincere condolences. Know that you guys are in my thoughts and prayers. Silva Family, I pray that in your sorrow you find comfort in all the joyful memories of Loren. You are in my prayers as you grieve the loss of Loren. Our hearts go out to you and your family. Although I don’t know exactly what to say, I want you to know that I am with you in thought and wish you comfort and peace as you remember Loren. Loren always treated me with kindness, friendship, and respect, and I will always remember her that way. My deepest condolences to her loved ones for the loss of such a genuinely good person. Allyson I’m so sorry for your loss . My thoughts and prayers are with you and your family. Uncle Bobby, Aunt Susan, Allyson and Little Bobby — we are so sorry we can’t be there. We’re thinking of you all and keeping you in our prayers daily. We are always here for you, we love you guys so much! Dearest Bob, Susan, Allyson, Bobby Jr and sweet Sydney Rose. Joe and I are so deeply sorry for the passing of your daughter, sister and Mommy to Sydney Rose. Loren was a sweet, beautiful soul. Always a smile on her face. She had the gift of making others smile and feel special. She will be greatly missed by everyone who had the pleasure of knowing her. We love you Rosie. May you be resting peacefully in Gods gentle hands. Bob&Sue,My dearest condolences to you and your family.Rosie is a beautiful soul.She would light up a room with her infectious smile. We will miss her tremendously. Bob and family may our thoughts and prayers be with you during this hard time. We hope you can find some peace in the memories you have with your daughter and joy with your granddaughter. Bob & Sue sorry for your family’s loss . Bob & Family, we are thinking of you, wishing you hope in the midst of sorrow, comfort in the midst of pain. To our friends, my heart and deepest prayers are with you all. I will always remember Rosie as a child and the joy she brought with her smile. Rosie you will always be remembered as someone special to us. Loren, I wish I could have told you more profusely how much you meant to me. I believe in your heart you knew, and I am blessed for every moment I ever got to spend with you. From conversations that never saw the outside of the ambulance, to anything life threw at you or I; I knew I had a confidant in you and vice versa. Love you so much, thank you for leaving the world a piece of you in sweet baby Sydney. Dear Silva Family. My deepest condolences on Rosie’s passing. Please know that my thoughts and prayers are with you. RIP dear Rosie. We will keep each of you in our prayers during this heartbreaking loss to your family of your beloved Loren. May God give you all strength during this heartbreaking time for your family and always. My one and only true best friend, I cannot believe you are gone. You’re soul could make anyone happy! I will always be missing you and talking to you! To the Silva family, you were always my second family growing up and I’m so sorry for your loss! Rest in the sweetest peace Loren! Madi and I extend our deepest condolences to the entire Silva Family. So so sorry for the passing of Loren and know we are thinking of you during this grieving period. God Speed Loren Silva. To the entire family, I am so sorry for your loss. You are all in my dearest thoughts and prayers. May Loren watch over your family and her sweet baby girl, as a beautiful angel in heaven. I will be thinking of you all. This just breaks my heart, speechless. Thinking of you all.